For activities with with Children and for Adults click the links on the right. The booking form for 2011 is available now. The course runs 21-24 Feb. 2011 and is part of a mini-festival, Worcester Early Music Week - with concerts each of the four nights. We are currently fundraising in order to operate this independently of Worcester Arts Education. Cost is now £100 for the course (which includes free admission to all the concerts as well as tuition for 4 days). Please enquire about bursaries (apply by letter). Early bird discount (10% if you apply by 15 December 2010). Our course for 2010 was a success. This course received financial assistance from The Elmley Foundation. To view the leaflet click here. To download a booking form, cilck here. Both are in pdf. Geared to those who live or study in Worcestershire. *We are seeking vocal soloists from amongst the choir. *Coaching for wind players will be part of the course this time. The Baroque Orchestra course first took place in May 2008 and then again in February 2009 at the Worcester Guildhall. A perfect match in terms of architecutre and time period, the Guildhall has a splendid wooden floor, long gallery feel, and acoustic that is fitting for the music of the Baroque. We have enjoyed the support of the Mayor's Office, and the very helpful staff who work at the Guildhall each day. The tutors have been Micaela Schmitz, Kate Fawcett, and Henrik Persson. Grade 6+ took part for Feburary 2010's half term. In May 2008 we did only string repertoire. We had quite a number of singers from Prince Henry's High School in Evesham and some of the Worcestershire Waits joined us as well. A true chamber feeling was achieved, as this exclusive ensemble was a select size. A real plus for baroque music is that each player had a chance to be a soloist. They also performed a Playford dance called 'The Black Nag' for the appreciative audience! The Elmley Foundation is a grant-making charity founded by the late Countess Beauchamp, widow of Viscount Elmley, the 8th and last Earl Beauchamp of Madresfield Court, near Malvern. Over many generations, Madresfield Court established a tradition of support for all forms of the arts, crafts and design. Now that charitable sources have come to replace the personal enthusiasm and commitment shown by many family benefactors of the past, The Elmley Foundation perpetuates Madresfield’s considerable encouragement to the cultural life of Herefordshire and Worcestershire. The Foundation’s Trustees are therefore particularly delighted to support the Baroque Orchestra course. Visits to Madresfield Court can be made, by appointment only, between April and July each year. To book, contact the Estate Office, Madresfield, Malvern, Worcestershire WR13 5AU. madresfield@btconnect.com. Telephone 01905 830680. 5, Deansway, Worcester WR1 2JG. NEW- Audio Tracks of the Waits can be downloaded here. Bromsgrove Waits was launched in Autumn 2009 with grateful thanks to the David Morgan Music Trust and Worcestershire Arts Education. To download the leaflet click here. 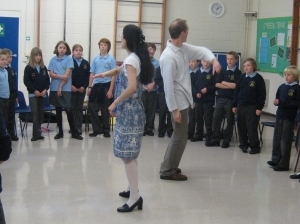 In the weeks of 23 November and 30 November 2009 we visited Middle schools and secondary schools in the Bromsgrove/Hagley area, culminating in a sharing concert on 3 December 2009. The Bromsgrove Junior Waits started meeting in earnest in January 2010 on Thursdays at Parkside Middle School. Year 5 and up were invited to join. Singers were encouraged to take part and Instrumentalists Grade 2+. The Worcester Waits did a special project on Monterverdi with The Orchestra of the Age of Englishtenment. Worcester Waits gave repeat performances on 11 July 2009 for visitors to the Commandery, Sidbury, Worcester. Much is Civil War era in keeping with the building. Free with admission to the venue. In 2007, Cathryn Dew, Andrew Watts, and Micaela Schmitz started the Worcestershire Waits, an ensemble for 10-16 year olds in Worcestershire. The group have been meeting weekly for two years now. The project has been funded, via Youth Music and Singworks, by Worcestershire Arts Education. Many have had the privilege of trying our matched set of recorders. The Mollenhauer Dream series were bought specially so they could achieve a Renaissance sound with standard (more Baroque) fingerings. We also incorporate percussion, and our concerts usually follow a theme- including such themes as Christmas, a Renaissance Carnival, Pilgrimage, the English Civil War and more. They were invited in 2008 to perform at the prestigious showcase, Voices and Visions. We have enjoyed a great partnership with the Commandery in Worcester which, whether decorated in a medieval theme at Chrismtas or set up for its most obvious link, the Civil War, gives a superb ambience to our performance. Despite its lack of central heating, the students always enjoy being there! 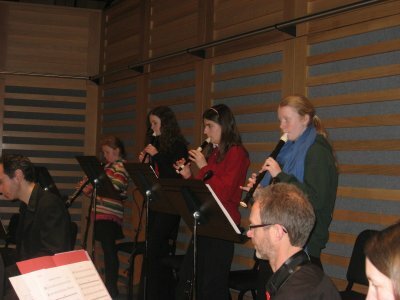 Our students have taken part in projects with the Orchestra of the Age of Enlightenment, perfomring at King Place and even participating in premiers of new commissions. What an exciting group of young people we have! Andy and Micaela giving 'taster workshops' to primary aged children.